If there is anything I regret most about not starting my sewing career sooner, it's that I didn't get to sew for my daughters before they were born. What fun it would have been to make baby quilts and bibs, tiny dresses and stroller blankets while dreaming of the little ones on the way. Thankfully the parade hasn't completely passed me by -- I've had the chance to make several baby quilts for friends and family this year. The one you see above was a quick finish. I cut out the pieces last night and sewed them together today. I'm calling this one Color Study. I had so much fun choosing the prints for the charm squares. 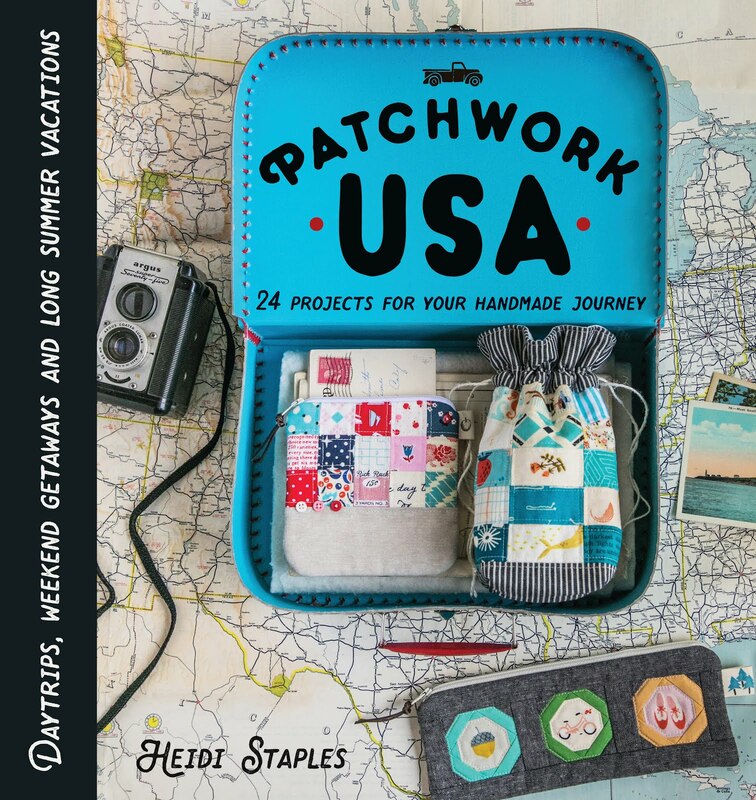 There's a lot of Denyse Schmidt in there -- I just can't help gravitating toward her beautiful fabrics -- but you'll find a number of other designers represented here as well. The center print is a wonderful text print from the new Field Notes collection which I happened to see at Fat Quarter Shop, and I used a black tape measure print for the intersecting lines. The back of the quilt is just three lines of fabric: more tape measures, a dot print from Bonnie & Camille's Marmalade collection, and ABC Critters from Mind Your P's and Q's by Keiki. That last one is such a perfect fit for a baby quilt -- how can you resist those darling little animals? I bound the quilt in a black and white Voltage Dot print from Chicopee by Denyse Schmidt. I'm sorely tempted to keep this one for myself, but I'm content to know that it's going to a very good home. Linking up to Sew Cute Tuesday & Fabric Tuesday. You would never know it by looking at my closet, but I absolutely love fashion. My small clothing budget and plus size figure don't always make it easy for me to indulge in this area, but I've made my peace with it by a) living vicariously through my Pinterest board and b) making it a goal this year to build the best wardrobe that I can afford. My first step toward that goal was promising myself that I would not buy another piece of clothing that I didn't truly love. I can only imagine how many hundreds of dollars I've spent over the years on clothes that I bought on sale or on impulse that ended up being a mistake. Of course, every now and then I find something in the stores and I think, "That would be absolutely perfect if it weren't [too long, too short, too small, too ugly -- fill in the blank]." This happened last week in Target when I spotted what is actually a junior's dress. The thing was ridiculously short on me -- I'm almost 5'11" tall, and it ended over a foot above my knees -- but I loved the upper half. Then suddenly it occurred to me: I sew. I could cut the bottom off this thing, hem it, and have a brand new top that I loved. I quickly dropped this dress and another one in green into my cart and headed for the checkout lane before I came to my senses. Linking up with Weekending at 1/4" Mark. I was pretty happy when I found out that Rachel of Stitched in Color had selected me to be one of four participants in her latest Scrap Challenge sponsored by Julie at The Intrepid Thread. The task was to make a project using only this fat eighth bundle and one extra fabric if desired. I signed up to make an EPP mini quilt using hexagons and diamonds, and though I usually head down any number of rabbit trails during the creative process, I was able to stick to my original plan for once. I knew that I wanted to use large hexagons and pairs of diamonds that pointed in opposite directions (hence the name), but it took me a long time to decide how I wanted to place these three rows together. After much shifting and turning and flipping around, I decided on the layout you see here. Three of the prints were featured in large hexagons -- these have two and a quarter inch sides. I always love the way that you can draw attention to patterns within a pattern through fussy cutting, and it was fun to choose the parts I wanted to highlight in those hexagons. For some reason I had a difficult time getting all of the quilting to show up in my photographs, but you can see it best on the back of the quilt. Please pretend that you don't see the wrinkles -- my iron kept trying, but it had trouble making headway on this stubborn piece of fabric. The background and backing of this mini is Robert Kaufman's Essex linen in natural. I thought about binding the quilt in linen as well, but I went with a scrappy binding instead, and I'm so glad that I did. It's nice to have that extra pop of color around the border. This was the first project I've made using my new EPP case, and I'm completely in love with it. Having an organized place for every step of the process makes it so much easier to pick up a project whenever I have a free moment -- definitely a helpful feature for a mommy on the run! My thanks to Rachel and Julie for the opportunity to play with this lovely bundle of fabric. It was a pleasure indeed. When I was a little girl, I used to pore over the American Girl catalogs that my grandmother mailed to our house -- she has always been a doll collector and believes in starting them young. The cost of all the items were light years out of our family's price range, but I would spend hours happily turning the pages and making lists of things I wanted to buy. It's given me quite a laugh to watch Bunny do exactly the same thing this past year with those catalogs (which my grandmother is still sending), proving that she is indeed my daughter in every way. Today is Bunny's sixth birthday, but we had her party on Saturday so that the family could all come. And the special package from my husband's parents this year held an actual American Girl doll inside -- the first one that anyone in our family has ever owned, giving Miss Bunny an honored rank similar to the first person in a family to go to college. Since Bunny tells me that Ruthie the doll is in desperate need of bedding and clothing, and since we don't have the Swiss bank accounts that one would need to purchase these items from the people at American Girl, today was the first of what will be a standing weekly mother-daughter sewing date to create Ruthie's wardrobe and accessories. Today's item was a sleeping bag and pillow set. I had planned to make Ruthie a doll quilt and buy an inexpensive doll bed online, but apparently they don't exist (the cheapest one I could find was $40 -- obviously I'm in the wrong business). My design was based on a tutorial which you can find here. Bunny begged me to buy a charm pack of Aneela Hoey's new Posy collection last month, so I let her use that for this project. She got to choose the layout for the charm squares and help me guide the fabric through the machine for some of the sewing. Most of the interior is one of the Posy prints along with a strip of Waffle Pink from Monaluna's Havana collection. I bound the sleeping bag in a grey and white crossword puzzle print by Tim & Beck. I love the simplicity of this design. There are no zippers to bother with and the buttons are purely decorative. You can make the bag with a single piece of fabric, but doing the charm squares makes a sweet patchwork version that fits Ruthie's 1930's time period quite well. Some of the Posy prints -- especially those bunnies in the picture below -- even have a bit of a vintage vibe, I think. This collection just couldn't be more perfect for little girls. Since I didn't want Bear to feel left out, I let her pick two charm squares from the pack, and she helped me sew a simple coaster to put under her water cup in her room. We had so much fun making this together, and Bear was absolutely thrilled to pieces with the result. She's been carrying this coaster around with her all day long. I definitely want to sew with my girls more often. It's great to see the pride they feel in being a part of making something that they're really going to use. Bunny was watching me as I ironed out a few of the seams we had just sewn together, and she suddenly flashed me a blinding smile. "I like sewing, Mommy! I think I'm really getting the hang of this!" Then she reached over and hugged my arm. "You're the best Mommy in the whole entire world." I am so excited about the project I'm sharing with you today. This block of hexagons has stumped me for weeks, as I tried to decide what I wanted to do with it. Well, I finally figured it out. Meet my new English Paper Piecing Case. The retro library case that I made last year never got around to carrying books -- it was too perfect for holding my EPP projects on the go. But since there's only one pocket on the inside, I usually found myself stuffing all my pieces into various Ziploc bags. Efficient, but not very pretty to look at. This little organizer has been a long time coming, but I am absolutely thrilled with it. Take a look, folks. There's a pocket for everything...everything -- paper pieces, basted pieces, scissors, thread, seam ripper, and fabric! I even zig-zag-stitched a tiny pincushion to the center of the case; I like to have a landing spot for my needle when I'm working on a project in the evenings since needles that get set down in my room have a way of disappearing and then reappearing in someone's foot. I used black yarn dyed Essex linen for the body of the case and sewed down the hexagon block on top of the outside. The inside features my new prints from Shelburne Falls by Denyse Schmidt which I absolutely adore. I used another DS scrap for the flap and lined it with a fun Japanese print. If you're interested in making one for yourself, the design for this case is very similar to the Navigator's Clutch tutorial I posted last summer which you can find here on my tutorials page. There was quite a bit of bulk on the edges with the extra pocket and the extra layer of hexagons that I added for this version, so I had to go slowly and be patient. It was so worth it, though. This little case is going to be well used and well loved. Back when I was single, I hated Valentine's Day with a passion. What a lousy excuse for a holiday, I always thought -- as if couples really needed one more excuse to gush and we single people really needed one more giant blazing sign to remind us that we were alone and left out. I had other single friends who felt the same way. We did our best to make something positive out of the day, going out to dinner together and often giving each other small gifts. Still, I was always happy to put the day behind me on the fifteenth. After I met my husband, I was determined not to forget what Valentine's Day was like for me before I was married. We soon made a tradition of having our big date on another night (when it was easier to get a table, anyway) and inviting single friends over for dinner on the actual holiday. It was a fun way to spend the evening, and I was happy to help my single friends get through what was a really difficult day for some of them. This year we don't happen to have anyone coming over, but I was telling my husband this week that I want to keep our tradition of celebrating Valentine's Day as a family holiday. Today has been full of Valentine making, cookie decorating, and little girls twirling in their pink ballerina dresses. I'm learning more every day about how much of my joy is found in making happiness for others rather than trying to find it for myself, and that's something I want to pass on to my daughters as well. As we go through the years ahead of helping our girls grow up into young women and all the emotional issues that will be involved with that, I hope they will always remember that love isn't something they have to go looking for. It's something they can share with those around them, and something they will always have here with us. "I have found the paradox," said Mother Teresa, "that if you love until it hurts, there can be no more hurt, only more love." ...drooling over this stack of incoming fabric mail and, yes, plotting to order more. Shelburne Falls...you need it. Trust me. ...finally making the churn dash quilt I've been wanting for months. I'm so excited about this one. ...starting work on my Intrepid Thread Scrap Challenge bundle. I can't wait to start paper piecing these beauties. ...trying to decide what this is going to be. I had originally planned to make it into a pillow, but I've made so many lately that I'm itching to try something else. Any ideas? ...booked to the rafters. With Ash Wednesday, Valentine's Day, Bunny's 6th birthday, and a much anticipated visit from my parents-in-law all happening in the next seven days, we have a rather full schedule going on this week. At least life isn't boring. 1) I have become addicted to making pillows. 2) I would love to accent every project I make with Robert Kaufman's gorgeous Essex yarn dyed black linen. 3) I adore the simple beauty of patchwork. 4) I'm crazy about Julie Comstock's Junk Drawer print from Odds & Ends (of which I may or may not have just ordered another yard this evening...). A lovely weekend to you all. Over the past year, I've been slowly building a Heather Ross stash. A small bundle here, a scrap pack there, the occasional splurge on Etsy for something out of print. I've used pieces in my projects as I've gone along (here, here, and here are prime examples), but I finally decided that it's time to make a Heather Ross quilt to hang on the wall in the big girls' room. It's incredibly daunting to cut into this fabric, some of which is so rare and all of which is gone forever if I make a mistake. I keep repeating Amanda Jean's motto to myself: it's all just fabric...right? Linking up to A Lovely Year of Finishes and Work In Progress Wednesday. So here are the results of my adventure in the world of cathedral windows. The pillow on the left was my first attempt which you saw in yesterday's stop on the Something New Sampler blog hop, and all of the windows were sewn by hand. The pillow on the right was today's little experiment -- I wanted to see what it was like to sew these by machine. Boy was there a difference. Doing these by machine takes about a quarter of the time, and the windows look so much more stable to me. If you're on the fence about doing cathedral windows because of the time investment, definitely take the machine route. I've been planning on making a pillow that my husband can use to support his back when he's relaxing in the evenings. Though he insisted that he hated the idea of having my hard work sandwiched between him and the chair where no one could see it, I thought that the colors in this block were manly enough for a guy's pillow. I really love the way these quiet Timber & Leaf prints are set off by the chocolate brown linen. They almost remind me of watercolor paintings. I have a good amount of this collection left over, and I'm looking forward to making something else with this fabric in the next few months. I was able to purchase a wonderful scrap pack of Katie Jump Rope a few weeks back, which I absolutely love. They seemed to be the perfect prints for another small set of cathedral windows, and I'm so happy with the way they turned out. With all the cheerful colors and that border of natural Essex linen, this pillow just looks like a little glimpse of summer to me. And the back -- I'm just crazy about this print, which I was also able to pick up online. God bless the fine people at Etsy. What on earth did we do before they came along? My final verdict on cathedral windows? Try it at least once, preferably by machine...unless you have way more time on your hands than I do. Linking up to Fabric Tuesday. 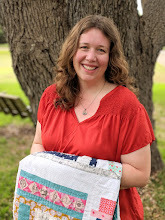 Amy of The Cute Life has been hosting a great series this year called the Something New Sampler -- a wonderful opportunity for all of us to try a new technique and turn it into a 7 x 14" quilt block which can then be turned into something else fun. Having been dazzled by the versions I've seen online, I decided to go for the gold and try cathedral windows for my day on the blog hop. Now that I'm on the other side of the experience, I can say in all honesty that cathedral windows are pretty unbelievably time consuming, but you can almost forget about that when you see the finished product. Let's start with a few disclaimers. First, I owe my understanding of the cathedral windows process almost entirely to a superb tutorial by Angela Nash for Moda Bake Shop which I highly recommend that you read after (or before) reading mine. The dimensions are different, but the process is the same. If anything that I say in this post doesn't make sense, just go check out Angela's version to clarify. Second, I decided at the beginning of January that I was going to be Super Blogger for this project, finishing most of my block and writing down all my instructions back during the second week of January. Guess what happened when I went looking for those instructions this afternoon... I am constantly scribbling directions for tutorials and projects in about four different notebooks that I keep on hand. God only knows what happened to this one, but it's currently missing in action. I reconfigured all my cutting instructions and directions as quickly as possible today, and hopefully I didn't forget anything, but if something doesn't work out exactly right or a step is missing somewhere, just let me know. Place the square of cardboard in the center of a 6.5" square of solid background fabric. Mark some fabric glue along the top and bottom corners and fold the side edges of the fabric down, ironing them into place. Do this again with the corners, and fold the side edges into place, pressing again so that all the edges are crisply folded. Remove the cardboard and repeat with the remaining seven squares. Fold the fabric square in half both vertically and horizontally, pressing each time so that the lines clearly show, and then unfolding the square again. Turn the square over so that the folded cut edges are on the top and fold each corner to meet in the middle, being sure to carefully match the fold edges on the outer sides (see Angela's tutorial for more detail on this step). Now fold the corners again into the center, this time taking special care to evenly meet the corners neatly in the middle. Press the folds again. Repeat the folding steps with the remaining seven squares and line them up in a two by four grid. Take two of the folded squares and place them back to back so that the folded openings are on the outside. Open one outer folded corner and pin through the fold line, checking the other side to be sure that they are carefully lined up along matching fold lines. Stitch carefully along that fold line, making sure when you are done that the squares are sewn together yet also able to fold closed again naturally. Repeat this step with another pair of squares, and then sew the two pairs together in a line of four. Do the same with the remaining four squares, and then sew both rows of four together down the middle. Take the eight 2.75 squares and place them inside the folds of the backing squares. Once you have decided on a pattern that you like, use a little fabric glue to hold them down. Then carefully sew about 1/8" inside the outer corner of each square so that they are firmly held down. Press the folds back into place. It is very helpful to sew a few quick stitches (by hand or machine) at the center of each folded square to hold the corners together while you sew the windows. These can be removed later when you're finished. Now place the ten 1.75" squares for the windows onto the three vertical rows of squares in the middle (refer to the picture above). You can use your finger to gently pull in the middle of each folded square edge so that you can see what the background will be behind your windows to help you decide how you want to arrange your squares. Once you have your chosen layout, I found it helpful to ever so slightly trim the sides of each window square to follow the curve of the window and then use a little fabric glue to hold it down in its spot. How you decide to sew your cathedral windows is now up to you. I decided to do mine by hand because I love to have a hand sewing project to work on in the evenings while I watch tv with my husband. To do this, you simply pull back the middle of each side of the window squares which falls into a very natural curve and sew it down, almost like sewing binding on the back of a quilt. You'll do the same with the squares along the oval edges as well. If you prefer to machine stitch your windows, just refer to Angela's tutorial for directions on that. When your windows and ovals are all stitched in place and nicely pressed, sew the 2 x 5.5" pieces of background fabric on the short ends of the block using a quarter inch seam allowance and press. Repeat with the 1.5 x 16.5" strips on the long ends of the block. Trim off any excess so that you have a nice 7.5 by 14.5" unfinished block.